Everyone knows Eisenstein as a theorist and practitioner of something called montage, which in his hands comes to mean a lot of things. But he was no less interested in what he called expressive movement. He believed that the viewer could be aroused by dynamic physical action that carried powerful feeling. Expressive movement pervades the set-pieces of his silent films. On the Odessa Steps of 1925’s Battleship Potemkin (1925), we get the robotic descent of the Cossacks opposed to the agitated flight of the citizenry, and the street massacre of October (1927) makes even mechanical bridges seem ferocious. And less flamboyant moments, from the animalistic antics of the spies in Strike to the weeping masses at the Odessa quai, are full of expressive postures, gestures, and facial behavior. Eisenstein sculpts the human body so as to project extreme states of feeling. 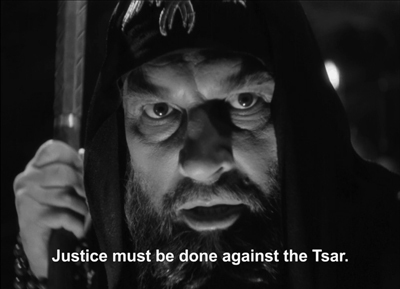 That effort is on full display in Ivan the Terrible Part II, which I discuss in our current entry on FilmStruck‘s Criterion Channel. My commentary, grounded in a single sequence, builds on an analysis I offered in my book The Cinema of Eisenstein, but the clever experts at Criterion have created dynamic juxtapositions through cuts and replays that I couldn’t summon up in print. I try to show how, as ever, Eisenstein sacrifices bland realism of behavior to something more sharp and intense. In this “theatrical” film, he goes beyond line readings to offer maniacally heightened physical action–a sort of deadly serious, amped-up, live-action cartoon. Eisenstein worshipped Disney, after all. Today’s blog entry bounces off that installment to show the connection between expressive movement and the most banal stock-in-trade of cinema: the standard scene of two people talking to each other. A sketch from Eisenstein’s lectures on Crime and Punishment. Eisenstein’s silent films seek a “dramaturgy of film form” that would surpass traditions of theatrical and novelistic storytelling. This mission, which creates a sort of epic cinema, left an odd gap. From Strike (1925) to Old and New (1929), his films are notably lacking in one stock ingredient. He seldom creates sustained scenes showing a developing conflict between two characters in an ordinary setting–a parlor or office or street. 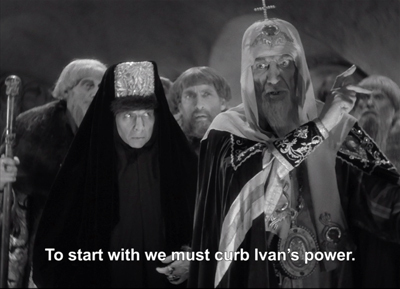 With few exceptions, Eisenstein “explodes” even standard scenes by cutting to action elsewhere. The factory owners of Strike chortle over drinks while, thanks to parallel montage, the workers are rounded up by soldiers on horseback. Other Soviet Montage directors were willing to work up theatrical scenes: Pudovkin has a Hitchcockian suspense sequence in Mother (1926), while Kuleshov turns the second stretch of By the Law (1926) into a Kammerspiel. 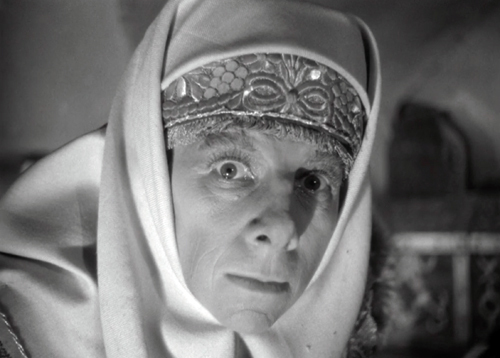 But Eisenstein’s urge to splinter face-to-face dramaturgy came from a different sense of theatre–that “Theatricalism” of his teacher Meyerhold, who saw the stage not as the copy of a real space but as an arena for performance. Eisenstein extended this idea by thinking of the shot and the sequence as an arena for action, specifically expressive movement. By the 1930s, Eisenstein may have sensed that sound cinema would make films more theatrical in a traditional sense. Sequences would be more concentrated in one locale and focused on a few characters. Crosscutting, a mainstay of silent film, would become rarer. He accordingly began to ponder creative ways of filming two-handers. In his courses at the Soviet film school VGIK he explored ways to intensify dramatic face-offs without interruptive cutting. The results of this line of thinking show up in his films. Alas, we have only glimpses in what remains of Bezhin Meadow (finished 1937; banned, now lost). 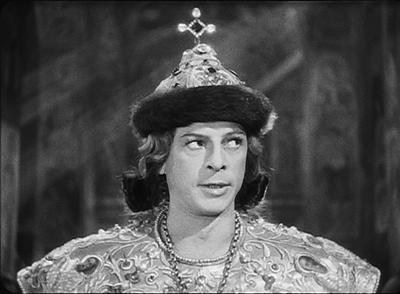 And Alexander Nevsky (1938), still conceived on a broad canvas, doesn’t really face up to the demands of intimate scenes. 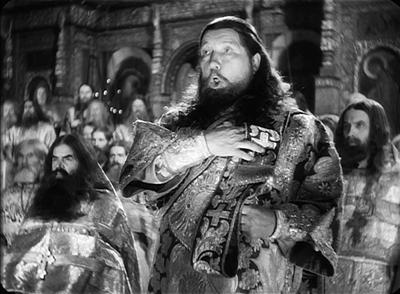 It’s only in both parts of Ivan the Terrible (1944, 1946) that we can see how Eisenstein plunged into doing what most directors do: filming uninterrupted scenes of people talking to one another. Needless to say, he doesn’t do it the way they do. Expressive movement is involved, but so too are other stylistic strategies. For one thing, Eisenstein rethinks analytical editing. Characters need not face one another; they can be turned to the viewer and interact by shifting their eyes. 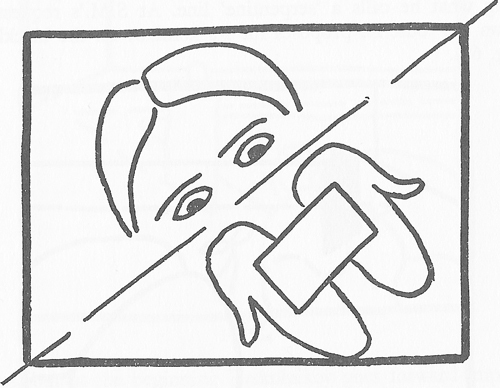 No need for over-the-shoulder reverse angles either; you can cut in or out along the camera axis. 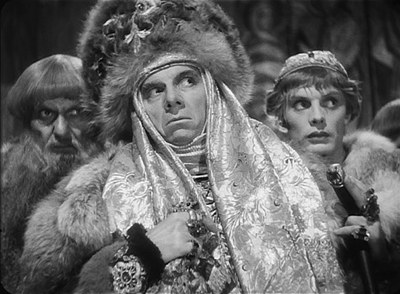 Both strategies are introduced at the start of Ivan the Terrible Part I. More elaborately, Eisenstein may dissect a scene through what he called in his VGIK classes the “montage unit” (uzel), a cluster of shots taken from roughly the same orientation. These yield chunks of space that overlap when edited together. 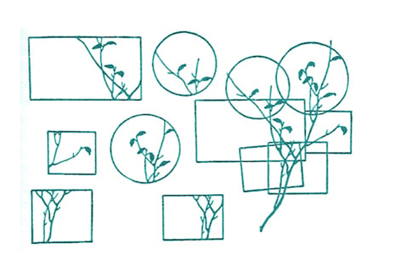 He diagrammed this procedure in an illustration of cherry blossoms he found in a Japanese drawing manual. This collage of overlapping bits, anticipating Hockney’s photo paste-ups, is actualized on film in the Pskov sequence of Ivan Part I, as I discuss in my book. Another strategy is the use of depth. While Renoir, Welles, William Cameron Menzies, and other directors were trying out deep-space staging and depth of camera focus, so was Eisenstein. 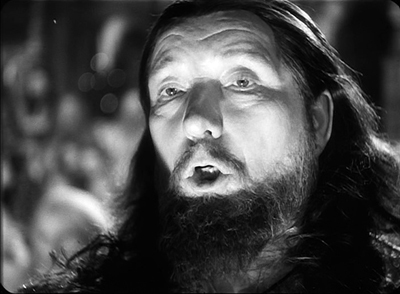 Well before Welles, he and his Soviet colleagues offered grotesque wide-angle shots. Below, Old and New and China Express (Ilya Trauberg, 1929). More rigorously, Eisenstein began to think of how to arrange his scenes along the camera axis. 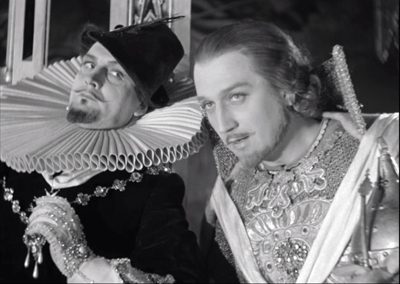 True, a great many of his scenes are staged laterally, with figures arrayed from left to right. But others, particularly those at a dramatic pitch, are staged in depth. And what distinguishes Eisenstein, to my mind, is a strikingly confrontational or immersive approach. 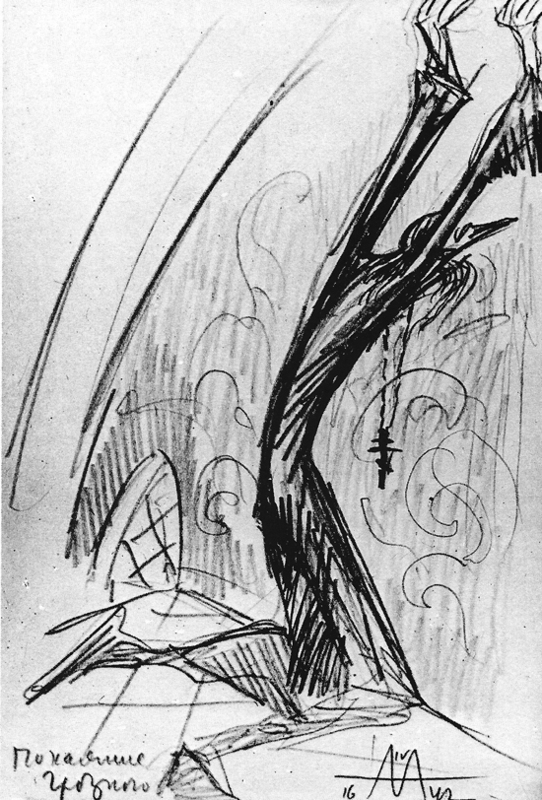 You can see it emerging in the VGIK exercises, notably in his stage designs for a hypothetical production of Thérèse Raquin. Here the paralyzed, speechless Madame Raquin terrorizes the murderous lovers with her glittering eyes. Eisenstein wanted the actors to perform on a turntable that would show her chair rotating to spy on the couple’s affair from different vantage points. At the climax, when the guilty lovers commit suicide, Madame Raquin’s chair was to break from the circle and propel itself forward, so that she would be staring furiously into the audience. 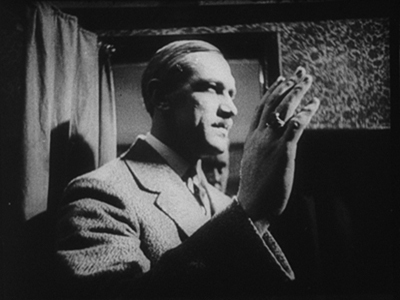 The footlights, marked with arrows, indicate that the effect is exaggerated by horror-style lighting from below. This effect might look gimmicky, a sort of stage equivalent for what we can easily accomplish in cinema. Don’t directors often heighten the drama by making their actors advance to the camera? But in many scenes Eisenstein moves his players toward us, then cuts further backward, letting axial cuts create an unfolding foreground. A new playing space is opened up, and the actor is free, or rather compelled, to thrust further forward, sometimes into uncomfortably big close-up. The Soviets called axial cuts “concentration cuts,” and we mostly find them used to enlarge, usually shockingly, something far off. But Eisenstein creates something more risky.“In my work,” he wrote, “set designs are inevitably accompanied by the unlimited surface of the floor in front of it, allowing the bringing forward of unlimited separate foreground details.” In principle the camera can back up again and again, and the foreground could unfold forever. The result sometimes yields direct address, as in my Criterion Channel example, but more generally it creates a sense of characters passionately engaged in clamping their will upon others and hurling themselves not just at one another but at us. Characters confide in the camera, and–long before all today’s talk of “immersive” cinema–the camera is us. The short lesson is that we still have a lot to learn from Eisenstein–and his films. Apart from opening up new vistas of cinema, they offer thrilling experiences. Ivan Part II, subtitled “The Boyars’ Plot,” is a dark Jacobean drama of bloody revenge and betrayal. It’s twisted enough to satisfy any connoisseur of palace intrigue. It’s also brilliantly weird as cinema. Once more the Old Man comes through. Thanks as ever to Peter Becker, Kim Hendrickson, Grant Delin, and their colleagues at Criterion for making this installment, which was a bit tougher than usual. Thanks as well to old friend Erik Gunneson, and to Masha Belodubrovskaya for translation help. Our entire Criterion Channel series is here. The best source for Eisenstein’s VGIK classes remains Vladimir Nizhny’s Lessons with Eisenstein, my pick for one of the top ten film books ever published. Direction, Volume 4 of Eisenstein’s Selected Works in Six Volumes (Izbrannie proizvedeniia v shesti tomakh, 1964-1969) is the source of other examples I use here, including Thérèse Raquin, from p. 622. 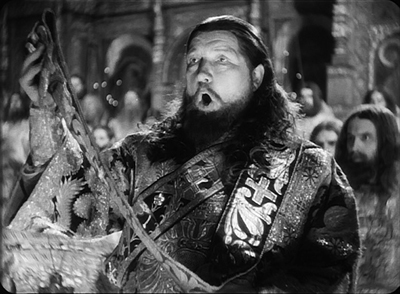 Of the immense literature on Eisenstein, I especially recommend Yuri Tsivian’s monograph on Ivan the Terrible in the BFI series. Yuri also provided a wonderful video essay for the Criterion DVD release, now unhappily out of print. 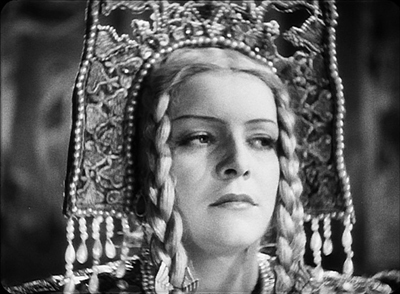 Kristin wrote a whole book on Ivan: Eisenstein’s Ivan the Terrible: A Neoformalist Analysis. I discuss Eisenstein as an action director in an earlier entry. 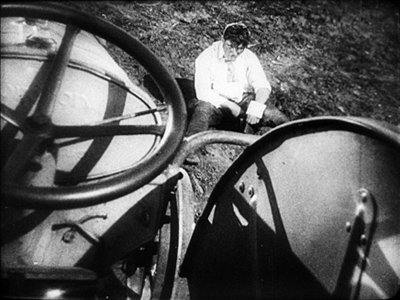 On axial cuts in Eisenstein and others, go here; Kurosawa’s use of them is discussed here. 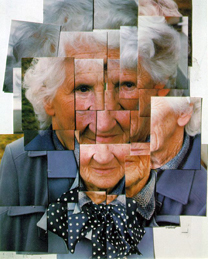 Hockney’s photomontage Mother 1 is from 1985. Also, too: I noted earlier that my book On the History of Film Style has gone out of print. An e-book edition, with updates and color images, is nearing completion. I hope to offer a pdf to you soon. Yes, Eisenstein is involved. 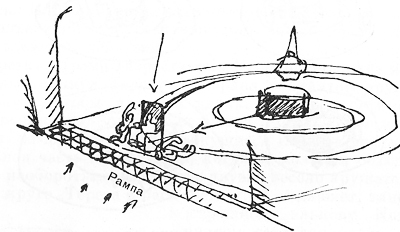 Eisenstein sketch: Ivan pleading for mercy in the Last Judgment, planned for Part III of the film. Kristin and I have been unusually busy during this year’s fest, its twentieth, so I got to see only ten of the vast array of offerings. Herewith a first report on what our intrepid team–Ben Reiser, Jim Healy, Mike King, Matt St John, and Ella Quainton–programmed and put before adoring crowds. Today we look at movies about movies. The title of Michel Hazanavicius’s Le redoubtable has been Francoanglicized as Godard mon amour, not a bad way of signaling it’s a French movie. (The same tactic turned Nikita into La Femme Nikita.) The title also lets us know it centered on the most important living director. And the possessive pronoun correctly puts us in the place of the heroine, the late Anne Wiazemsky, whose memoir-novel chronicled her few years with Godard. How could the film not take her side? On my limited exposure to the man, “difficult” doesn’t begin to describe his temperament. The film omits Anne’s role in Bresson’s Au hasard Balthasar, which Godard admired extravagantly, and takes us briefly through the shooting of La Chinoise (1967). Soon we’re plunged into ’68 debates about making commercial films, making political films, and “making films politically.” We’re firmly attached to Anne, to the point that Godard’s activities at the Cannes festival are kept obstinately offscreen while we see her sunbathing at a villa. There are unattributed voice-overs from an older male, but mostly we’re in Anne’s consciousness as she struggles to live with the torn, cruel, more or less ridiculous man who brought her into the film industry. 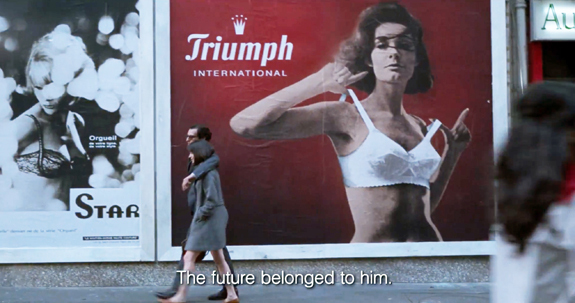 As a satire, the film goes for straightforward targets, such as the moments when people come up to our filmmaker and ask why he doesn’t make movies like Contempt any more. That seems to be Hazanavicius’s question as well. 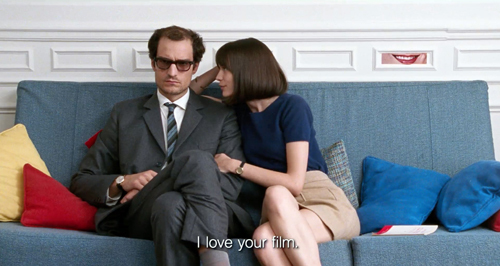 He makes no effort to match his film’s style to Godard’s work in the years when the story takes place. It would have been bold, though probably off-putting, to mimic La Chinoise or Le Gai Savoir (1969), one of his most daring experiments, a sort of Child’s Garden of Semiology. Instead we get snatches of pre-1967 scores, chapter titles, compositions, and iconography, with special emphasis on Une Femme mariée (1964), perhaps a sly reference to Anne’s role. While pastiching the early work, Hazavanicius softens its edges. One of Godard’s minor innovations, for instance, was inserting a chapter title partway through a new section, rather than planting it at the outset. That not only blurs the boundary between segments and usefully jars the viewer, but it also lets the title give a sharper commentary on the images around it. Tarantino embraced this technique, but Hazanavicius is tidier in his chaptering. Similarly, his shoutouts to planimetric framing don’t really exploit their disruptive possibilities. His film reminds us that Early Godard has become virtually a period style. Hence, perhaps, Godard’s own flight from it over the last forty years, in the process making films of exceptional beauty and abrasiveness. Still, we tend to forget how unsettling the early films remain. (At the Venice International Film Festival last year, Kristin attended the packed 400-seat screening of the restored Two or Three Things I Know about Her and reported that perhaps a third of the audience had walked out by the end.) Despite all his influence, the original Godard will never become “normalized,” just as Schoenberg will never become elevator music. Godard mon amour goes down easy and doesn’t, to my way of thinking, have a brain in its pretty head. Godard emerges as a wacky celebrity, politically confused and emotionally bullying. There’s no attempt to show how his personality surfaces in his art, or even why his art is important. Still, Godard mon amour usefully calls attention to a director who, in his 88th year, has another feature coming to Cannes. It’s called Livre de l’image, and it promises to be in five chapters, like the fingers of a hand. Made on commission from the San Francisco International Film Festival, The Green Fog is a collage exercise in associational mode, with echoes of Craig Baldwin’s work. In their own gonzo filmfreak way, Guy Maddin and Evan and Galen Johnson have created an homage to the city and its ultimate film, Vertigo. It can please on many levels. First, there’s the spot-the-clip quiz in the manner of Marclay’s The Clock. Some bits I found fairly easy to identify, but others are drawn from obscure movies and TV programs. All showcase San Francisco. Second, there’s the looping and twisting motifs of male-female tension, surveillance (films projected, phone lines tapped), and class identity: we’re forced to notice how tony restaurants set the stage for 80s big-hair melodrama. Then there’s the pleasure of watching how cutting can suggest expanding narrative trajectories through eyelines. 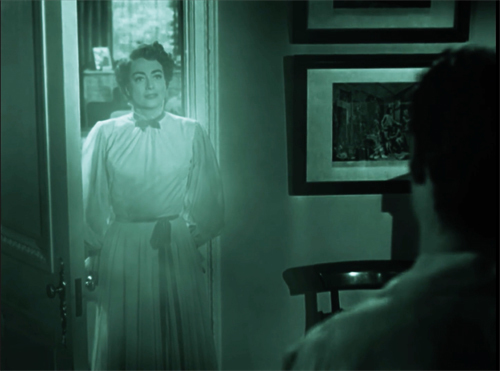 The Green Fog is an extended exercise in the Kuleshov effect. Sometimes the whole process gets embedded: people watch screens showing people watching people. 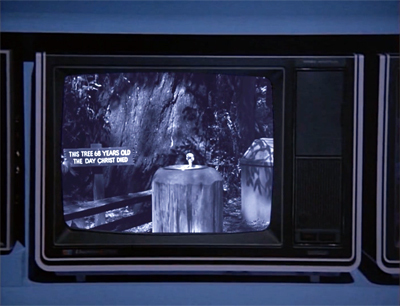 Or they’re watching a scene from another movie: McMillan, without wife, sees a tree that was 68 years old when Jesus was born. These linkages are accentuated by the habit of omitting lines of dialogue, so that characters seldom speak but, in shots plagued by visual hiccups, emphatically react to one another, sometimes just by smacking their lips or gulping. 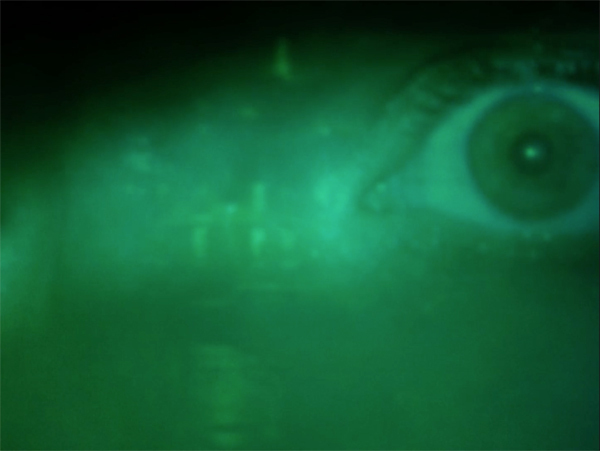 Not least, The Green Fog is a free fantasia on incidents and images from Vertigo. Although only one Vertigo shot is shown, the canonical moments are evoked by their mates in films both earlier and later: people scrambling up buildings and plummeting, couples embracing in horse stables, men pulling women out of the bay, and–thanks to the invading green miasma–a woman stepping out of a doorway to confront her lover. Scotty’s vision of Judy’s aura is made into a city-wide contagion of obsessive love. The film takes our memories of bits of Hitchcock’s film and spirals out from them, creating a hallucinatory whirlpool of variations on clichés. Going beyond Vertigo, the film evokes its own vertigo, a media phantasmagoria. I was reminded of Geoffrey O’Brien’s book The Phantom Empire. How did you wander into this maze, anyway, and how would you get out? Do you in fact want to, or do you prefer to sink deeper into it, savoring its manifold ramifications and outlying distortions? William Brinton and his wife Indiana were a colorful couple. They were nudists and kept a mummy in their living room. More to our point, around 1900 they ran an Iowa theatre and traveled throughout the midwest showing films and lantern slides. Brinton died in 1919, Indiana in 1955, and the executor of her estate in 1981. The Brinton collection passed to Michael Zahs–junior-high history teacher and confessed “saver” of things. Three truckloads of boxes came to Zahs labeled “Brinton crap.” They contained over 130 films, 700 magic-lantern slides, many sound recordings, and a host of vintage equipment. Zahs was told to bury the nitrate materials and dispose of the rest. Instead he hung on to everything, and eventually the American Film Institute and the Library of Congress selected several reels for preservation. 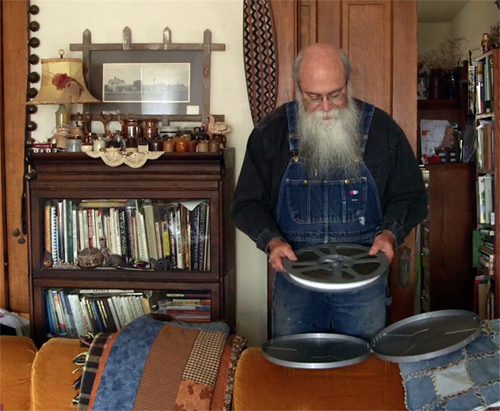 Since 1997 16mm copies of Brinton titles have been shown in festivities at the Graham Opera House in Washington, Iowa–a site recently declared by the Guinness Book of World Records to be the world’s oldest surviving film venue. The University of Iowa Library has committed to keeping safety copies of the entire collection. This fascinating story is brought to light by Tommy Haines and Andrew Sherbourne of Northland Films. Saving Brinton is, like Bill Morrison’s Dalton City: Frozen Time (reviewed by Kristin here), a heroic tale of cinema lost and refound. Morrison’s film centers on 1910s and early 1920s features, but the Brinton legacy takes us back to earlier times. 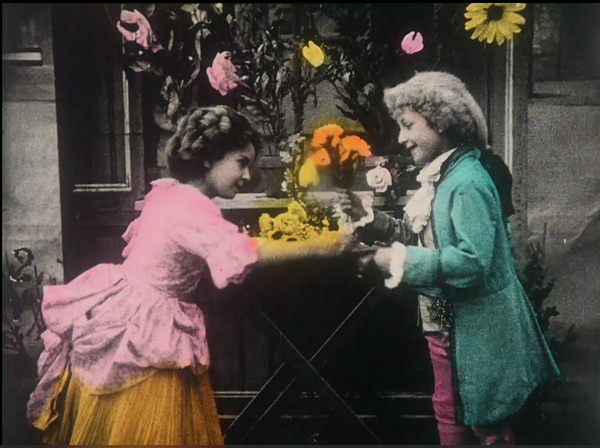 There are “actualities” (newsreels) and gag reels and even–watch Serge Bromberg’s eyes light up–a lost Méliès. Many items are in superb condition, with well-preserved hand-coloring. There are films from Lumière, Edison, and other major companies. In one, a powerful panning shot shows Teddy Roosevelt parading down Market Street in San Francisco (without green fog) just before the earthquake. And then there are the projectors and paper, including a Pathé catalogue. Saving Brinton is as much a portrait documentary as an account of film rescue. 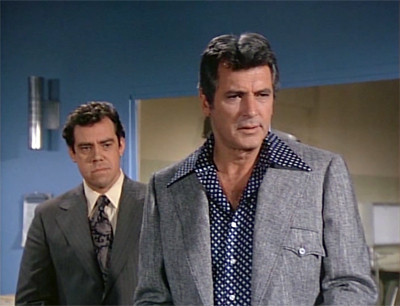 The Brintons stand out, not least for William’s fascination with airships, but the star of the present-day show is Michael Zahs. With his Darwinian beard and jovial presence, he comes across as one of those impresarios who knows a lot about everything, from chemistry to grave marker symbolism. For four years the filmmakers followed his efforts to preserve and show the Brinton legacy, while also tracing his personal life. We get scenes of his devotion to his ailing mother, who died during filming, and interplay with his wife, a smiling woman who doesn’t mind sharing her household with combustible materials. At the same time, this packed documentary evokes the community that welcomed Zahs’ cheerful obsession. As a graduate of the University of Iowa, I had to beam at the sheer niceness radiating from these people and their town and the earth they steward. On 23 April the University Library in Iowa City will be screening the whole collection, with seven projectors running the films on loops. You can sample them online, in pretty copies. And Saving Brinton will continue to tour festivals; you can track its progress here. This charming documentary is a must-see for everybody who loves old movies, not to mention flyover Americana. My quotation from Geoffrey O’Brien’s The Phantom Empire: Movies in the Mind of the 20th Century (New York: Norton, 1993) comes from p. 28. The Saving Brinton website gives more information on the film. Diana Nollen’s story in The Gazette supplies helpful background. Watch the trailer and glimpse our old friend Rick Altman, emeritus at the University of Iowa. The Language of Flowers (n.d.).